Nothing else on stage other than her pain: William Drew reviews Jean Cocteau’s end-of-a-realtionship monologue. Many years ago, a playwriting tutor declared to those students gathered around some table in some basement room near Russell Square that we should never use phone-calls on stage. We obediently wrote this down. Even now, I can see where he was coming from. A phone call takes the character outside the room and it is very essence of drama as we still generally understand it that it takes inside a delineated physical space. Whatever that “room” may represent, its physical manifestation is a stage which is a room, of sorts. This is part of the reason the audience are told to switch their phones off as we enter the auditorium. These devices would distract us, distract the performers, distract the stage manager by pulling any one of us or all of us out of this sanctified space. When Jean Cocteau wrote La Voix Humaine (1928, two years before it was first staged), it was an act of radical experimentation. Telephones in homes had become common-place but the idea of a drama that just showed one side of a conversation was unheard of. Now that we see this relatively frequently, it is usually a brief moment and often with someone else in the room so that the pertinent information can be relayed to them. What makes La Voix Humaine so unrelenting is the side of Cocteau: the classicist. He arguably embraces every Aristotlean unity (action, place, time) and focuses on one unnamed woman. There is nothing else on stage other than her pain. And yet on the other end of the phone there is a whole world: the world of her lover of five years who has left her. The piece casts us as detectives. Not only do we not know what he is saying to her but, as we cannot see him, we do not know whether or not he is lying. We can be pretty sure that he is but the woman is more than an unreliable narrator; she is an unreliable interrogator. Blinded by her love for the man who has just left her, she is afraid of making him angry, of doing anything that could make him end the call. Blink and you’ll miss the details that let you know what’s really going on. Cocteau’s text is now better known and more frequently produced as Poulenc’s opera of the same name (much beloved by Cocteau himself). What the opera does brilliantly is allow the music to contain the waves of violent emotion while the script itself remains extremely spare. In Daniel Raggett’s production for The Gate, there is nothing but the text in a remarkably faithful adaptation by the director. There are none of the elaborate sets that go along with the opera either. Sarah Beaton deviates from Cocteau’s suggestions only insofar as to move the action to a living room. The result is that it feels like a modest home, left in disarray by someone who is on the edge of caring whether she lives or dies. There’s nothing that stands out though. Without context, you’d just think she was messy. 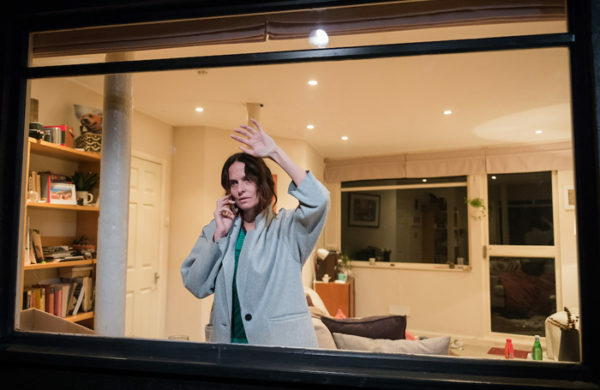 Leanne Best is the perfect choice for the understated naturalism required in this pared down setting. She lifts this production from something of historical interest to something more vital. You get the feeling throughout that you are watching something deeply intimate, a pain laid bare that is all the more poignant for her being physically alone while the person on the other line is out on the town. Is he listening to her? There are aspects of the transposition that require a bit of a leap. For example, the other phone-calls and the fact they keep getting cut off. In the original, the woman keeps going back to the operator “Mademoiselle” and here these beats have had to be missed meaning there’s no state other than connected or not connected at all. No limbo. The idea that she keeps getting cut off in the first place seems extremely unlikely with modern phones. Her lies to him (she tells him she is wearing a hat when she isn’t) might have been shocking in 1928 but feel toothless in the age of catfish. You might say that there’s no way that a woman in 2018 would let a man treat her like that. Subtly we discover the extent of his betrayal, his discarding of her but she never challenges him on it, never calls him to account. A modern woman surely would throw a torrent of abuse at a man who had strung her along for five years and thrown her away, telling her that he would burn everything that reminded him of her. And yes, perhaps she would. She should. But perhaps whatever the technologies we use to communicate, love will make complete and utter fools of us at times. The Human Voice is on until 6 October 2018 at The Gate Theatre. Click here for more details.